Smaller retailers in niche markets, like Southern Pawz, have been taking more market share from large, traditional retailers each year. Small retailers accounted for $200 billion in annual sales over the last five years, Deloitte confirmed. Here at Ecwid, our mission is to democratize e-commerce and help small business owners realize big dreams. We just celebrated our 7th birthday and our entrepreneurs are selling more now than ever before. In fact, Ecwid customers are selling 18% more per week now than during the same period last year. Entrepreneurship is a vision that strikes many of us at some point in our lives. For Shannon Jones of Southern Pawz, it’s practically a chronic condition. 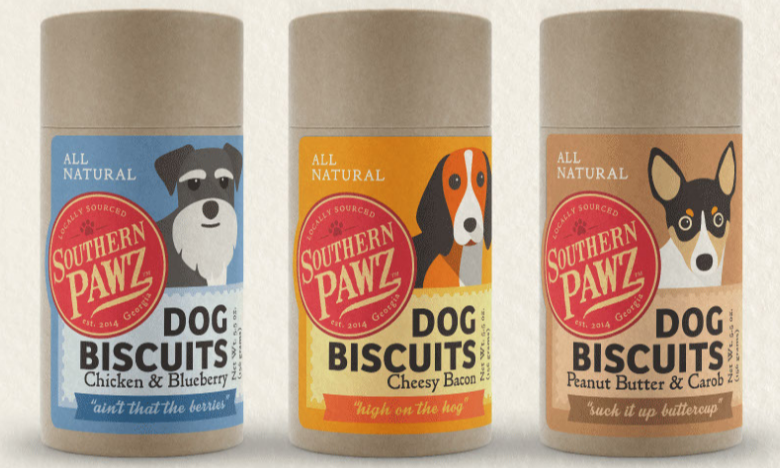 The lessons she’s learned from past ventures are paying off in spades for her home-grown pet treat business, Southern Pawz — a Southern pet treat and gift company that produces treats which are all natural and made with locally-sourced Georgia grown human grade ingredients. We sat down with Shannon to learn more about Southern Pawz, and the new spinoff shop, Simply Southern Pawz, launching later this month. Ecwid: How did you come up with the idea for your business? Shannon: It was actually born out of a scary experience back in 2014 with my Chocolate Lab fur-baby, Bella. Out of the blue, she had a terrible seizure. Without being able to pinpoint the cause I started looking deeper into the ingredients that were in her food and treats. I learned that gluten, a common ingredient in mass-produced pet foods, can cause seizures. Through my research, I started learning a lot about the pet industry and was dumbfounded at how huge it is! But, despite the size of the industry, I wasn’t able to find locally grown, preservative and gluten-free, organic ingredients that came from a supply-chain of which I could verify the origin. That’s when it clicked, and I saw the opportunity right in front of me! Ecwid: How did you get started, and do you have any start-up tips to share? Shannon: I floated my business idea to a few potential investors and three signed on. We used the initial funding to develop our unique packaging and branding, hire a web developer to create the website, and to source and purchase ingredients. Packaging was really important; I wanted reusable and recyclable packaging that was unique and would stand out from the typical treats on the shelves. I decided to source my labels from General Paper Goods, another family-owned Georgia company and became a member of Georgia Grown, a marketing, and economic development program of the Georgia Department of Agriculture, where I made key contacts to source ingredients. We’re using pure, unfiltered local honey from H. L. Franklin’s Healthy Honey, fresh-ground Georgia Grinders peanut butter along with local blueberries, chicken, cheese, and herbs — all premium ingredients that are sold primarily for human consumption, but are also safe for dogs. Additionally, we have responded to customer requests to go a step further in producing grain-free treats and will substitute the gluten-free flour we are currently using in two of our treats with Sea Island Red Pea Flour, a gluten and grain-free flour ground from peas grown in Coastal Georgia and South Carolina. In the near future, we plan to introduce two more products sourced from Georgia farms. Ecwid: What were some key wins that you had early on? How did you develop your brand and build a customer base? Shannon: We’re actually celebrating our first anniversary right now and I can’t believe how far we’ve come! Connecting with Georgia Grown was such a great experience. I was fortunate to have our treats displayed at the Georgia Grown store at the state fair in 2015, and we were featured there again earlier this month. Approximately 535,000 visited the Georgia National Fair this year. Last year we were the only pet brand featured, and the products just flew off the shelf! Proving the market at the State Fair gave me the confidence to keep going, as well as referrals and contacts that kept our momentum moving forward. I knew I wanted to keep the brand niche so I decided to try to find distribution channels via local retail stores rather than aim to distribute in the larger retail chains. I’m proud to say that In our first year, we’ve gotten our treats into more than 20 individual stores, and we have another 20+ pending in Georgia and other states. Ecwid: Wow, that’s a great first year! Would you do anything differently given the chance? Shannon: I would like to have had e-commerce up sooner. My fantastic brand/web development guy — who introduced me to Ecwid — was pushing me to take the online store live last year. We finally opened the online store last month and will begin promoting the site in a number of marketing channels the first week of November. I’ve been so busy growing the local distribution chain that online sales took a back seat. I also tend to overcomplicate things, and I had a hard time committing to product descriptions so I felt a little paralyzed. I know it’s important — profit margins on web sales are stronger than wholesale retail, and the online store will also help me get our name out and lay the groundwork for increasing distribution to the entire United States, and eventually to Europe! We will continue to encourage customers to shop with their local retailers who carry our products, whenever possible, since we believe that both sales channels are crucial to the vision of our company. Ecwid: You’re coming online with a vengeance! I was actually introduced to your business when you opened a second Ecwid store for Simply Southern Pawz. What’s happening with the new store? Shannon: One of my passions is helping others. Entrepreneurship is a lot more fun when you can work like-minded people to share ideas and innovate. In conversations with friends I’ve made through Georgia Grown, we came up with the idea to combine forces and bundle our products together and sell pet-focused gift baskets. We’re just about to launch the new Facebook store and shipments from our new Simply Southern Pawz Ecwid Starter Site will begin on November 15th! Ecwid: Speaking of your new site, you may have noticed that the Ecwid site for your new store looked a lot different than the previous version. Did you use your web contact to create this store, or did you manage it on your own? Shannon: I created it on my own, and it was so easy! I’m not a techie person, but I felt empowered setting up the new store. It was like you guys spoke my language in the instructions. I hate to admit that I was considering another company for Simply Southern Pawz because I needed XPS integration for shipping, and I didn’t think it was an option with Ecwid. Fortunately, I was wrong! I was able to integrate by connecting the free Webship app to my store and now it’s working perfectly. Ecwid: Thanks for sharing your experience! We’re really excited about the growing Ecwid app market and the new starter site. Speaking of shipping, so many customers tell us this can be a big headache. How do you handle shipping and fulfillment for Southern Pawz? Shannon: Believe it or not, I prefer to hand-deliver my wholesale orders, especially first time orders for new retail locations. If a retailer is in Georgia, I will always make the first delivery in person. Personal delivery helps me build a relationship with the retailer, and I can see exactly where my products are going and help the store owner set up the product display area. For re-stock orders, I’ve partnered with my small business group, and we’ve created a courier process to help each other out. When one of us has a long drive for a delivery we’ll reach out and see if anyone else needs items dropped off in the area. It saves everyone a lot of time and money! Ecwid: That is true Southern hospitality! What are you going to do when your online orders start flowing in from customers farther away? Shannon: I have big dreams of expanding beyond Georgia, and even beyond the United States. I’ll use XPS Shipper (through my USPS rep) to offer online customers in the US and beyond a variety of shipping options through USPS, UPS, and FedEx. Selling online globally is on the roadmap, and if everything goes well, I will translate my sites into several other languages as global online sales increase. Before I take sales to retailers outside of the US, I plan to take advantage of several state agency resources that provide assistance in researching new markets, adjusting pricing to local markets and offering support for a myriad of other issues that can arise when venturing outside of the country. Ecwid: It sounds like you have a lot going on – dare I ask what’s next? Shannon: Launching Simply Southern Pawz in a couple of weeks is at the top of the list. With the holiday season coming we think it’s the perfect time to market our new gift baskets and subscription boxes. Since we’ve just released the online store for Southern Pawz, marketing and promotion for direct customer orders are also underway. We’re also growing our product line by working with a local sustainable farm to package a rawhide roll-up and other treat variations. Since all of our treats are preservative-free, we are currently using dehydration as the sole means of preservation; however, in response to customer demand, we will introduce a softer treat (for dogs that have trouble chewing hard treats) using a natural, grain-free, preservative. 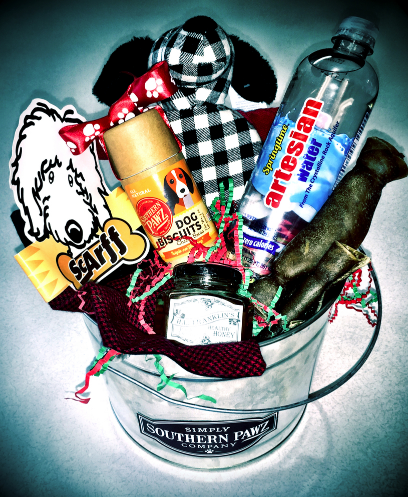 I hope to offer kitty-focused gift baskets and boxes in the Simply Southern Pawz store in the near future. Helping entrepreneurs like Shannon Jones bring their vision to life is what drives us to continually improve Ecwid. Like Shannon, here at Ecwid we also love our fur babies and appreciate the work of conscious retailers who help us make healthy pet choices. 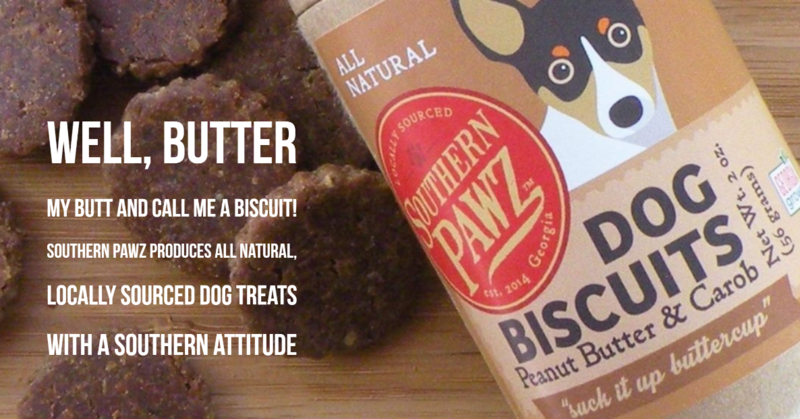 When purchasing from Southern Pawz, customers can be assured of the safety and quality of every ingredient that goes into the treats and that the young company is taking big strides to make sure the strictest safety standards are used as they grow into new markets. Perhaps the best news of all is that Bella, the honorary quality control supervisor at Southern Pawz, has been seizure-free, happy and healthy since starting her new treat regime.